The 2011 Global Assessment Report on Disaster Risk Reduction was prepared while disasters have continued to wipe out the lives and livelihoods of millions. The impacts of the catastrophic earthquake in Haiti in January 2010 and floods in Pakistan in July 2010 show how disaster risk and poverty are closely interlinked. Meanwhile, in 2011, floods in Australia, the earthquake in Christchurch, New Zealand, and the earthquake, tsunami and nuclear disaster wreaking havoc in north-eastern Japan as this report goes to press are a stark reminder that developed countries are also very exposed. Less visible internationally, hundreds of smaller disasters associated with climate variability have caused enormous damage in Benin, Brazil, Colombia, the Philippines and other countries. These events reveal how risks are continuously constructed through existing development gaps and growth in economic and population exposure. Moreover, as the Japan disaster highlighted, there are emerging risks and new vulnerabilities associated with the complexity and interdependency of the technological systems on which modern societies depend. This second edition of the United Nations Global Assessment Report on Disaster Risk Reduction provides a current resource for understanding and analysing global disaster risk. Drawing on a large volume of new and enhanced data, it explores trends and patterns in disaster risk globally, regionally and nationally. In parallel, more than 130 governments are engaged in self-assessments of their progress in implementing the Hyogo Framework for Action (HFA), contributing to what is now the most complete global overview of national efforts to reduce disaster risk. Findings show that accounting for disaster losses is a first step towards taking responsibility for, and assessing, disaster risk. Adapting existing development instruments such as national public investment planning, conditional cash transfers and temporary employment programmes, can help to scale up disaster risk management efforts to reach millions of risk-prone citizens. Such strategies reduce disaster risk and strive towards the objectives of the HFA, and are also important for adapting to climate change and achieving the Millennium Development Goals. The production of this report was coordinated by the United Nations International Strategy for Disaster Reduction (UNISDR) secretariat, in collaboration with many global partners. Financial resources were contributed generously by, inter alia, the European Commission, and the Governments of Japan, Norway, Switzerland and the United States of America. Many other countries and organizations provided human and technical resources supporting research, workshops and studies necessary for the development of the report. The risk of being killed by a cyclone or flood is lower today than it was 20 years ago, except for those who live in a country with low GDP and weak governance. Economic loss risk continues to increase across all regions – and seriously threatens the economies of low-income countries. Extensive disaster risk mirrors economic development pathways. The extensive risk of today can become the intensive risk of tomorrow. Disasters impact significantly and negatively on child welfare and cause internal displacement. Drought impacts most visibly on agricultural production, with significant losses spilling over into other economic sectors. Globally, drought is still a hidden risk and locally its social and economic impacts are disproportionately concentrated on poor rural households. Maybe more than any other disaster risk, drought risk is constructed by economic decisions and social choices. The number and quality of Hyogo Framework for Action (HFA) progress reviews is evidence of a growing concern for reducing disaster risk. The discussion of indicators and progress helps generate a common language and understanding. Whereas good progress is being made in early warning, preparedness and response, countries are still struggling to address the underlying risk drivers. Gender and public awareness are still not being adequately addressed. Investment in disaster risk management, particularly within sectors and through local governments, is severely limited. The sheer scale of recurrent and probable maximum losses should be enough to shock governments into action. Governments are liable for a significant part of total expected losses – and they rarely have the contingency financing to match this liability. Governments need to decide how much risk they are willing to retain and how much they can afford to transfer. A balanced portfolio of prospective, corrective and compensatory risk management strategies is the most cost-effective way to reduce disaster risks and support development. Development must be redefined to be sensitive to disaster and climate risks. The scale of public investment dwarfs current investment in disaster risk management. Existing social protection instruments can be adapted to reach out to millions at relatively low additional cost. Temporary employment programmes can contribute to the creation of risk-reducing community assets. Ecosystem-based disaster risk management often realizes highly attractive cost–benefit ratios. Conventional approaches to land use planning and implementation have failed. Truly participatory approaches provide an opportunity for scaling up innovative local initiatives. To ensure the coherence of policy and planning, overall responsibility for disaster risk management needs to be located in a central ministry with a high level of political authority. Where local capacities are limited, an incremental approach to decentralization may be the best way forward. The right to information on disaster risks is central to creating social demand and accountability. Engaging citizens and affected communities requires a shift in the culture of public administration. Amidst global uncertainty and change, the 2011 Global Assessment Report on Disaster Risk Reduction has some good news. Mortality risk associated with major weather-related hazards is now declining globally, including in Asia, where most of the risk is concentrated. In most of the world, the risk of being killed by a tropical cyclone or a major river flood is lower today than it was in 1990. This trend is particularly encouraging when compared to the rapid increase in population exposure to such hazards. Since 1970, the frequency of tropical cyclones has not increased, but ‘at risk’ populations have grown rapidly with global physical exposure to tropical cyclones almost tripling. Mortality risk for all weather-related hazards continues to be concentrated in countries with low GDP and weak governance, and mortality is still increasing in countries with weak risk governance capacities. Challenges to reducing flood risk were recently highlighted by the August 2010 floods in Pakistan which caused 1,700 fatalities and US$9.7 billion damage to infrastructure, farms and homes, as well as other direct and indirect losses.1 However, even in South Asia, flood risk mortality has decreased since 2000 and is lower today than it was in 1990. If five years after the signing of the Hyogo Framework for Action there is cause for celebration, this is it, though reducing mortality remains a brightly lit niche in a largely shadowfilled room. Rapid economic growth in many low- and middle-income countries has improved human development and reduced poverty for millions of people. This is matched, however, by an equally rapid increase in the exposure of economic assets to physical hazards. Particularly in higher-income countries, the risk of losing wealth in a disaster is now increasing at a faster rate than that wealth is being created. Although countries are strengthening risk governance capacities and reducing vulnerability, this is not happening quickly or effectively enough – increases in exposure have meant increases in risk. Estimated economic loss risk associated with floods and tropical cyclones is increasing in all regions (Figure 1). The proportion of the world’s GDP exposed to tropical cyclones increased from 4.13 percent in 1970 to 4.47 percent in 2010, while in absolute terms this tripled to more than US$1.9 trillion. Increases in economic loss risk associated with tropical cyclones were highest in high-income countries where they went up by 262 percent. Thus economic strength has failed to translate into lower economic loss risk, even in OECD countries. As the 2011 floods in Germany and Australia illustrated, even high-income countries struggle to manage increasing exposure, though these increases need to be put into perspective. Economic losses due to floods in South Asia are in absolute terms far smaller than those in the OECD, but relative to the size of South Asia’s GDP they are approximately 15 times greater. Thus, although economic loss risk in the OECD may be increasing faster, it threatens the economies of OECD countries far less than it does those of most low- and middle-income countries. for a large proportion of damage to local infrastructure and the housing and livelihoods of low-income households and communities. The exponential increase in damage associated with highly localized flooding, landslides, fires and storms in low- and middle-income countries indicates how risk is constructed alongside economic growth. The number of houses damaged relative to population growth in 21 countries and states has increased by approximately six-fold since the 1990s (Figure 2), far faster than the increase in economic loss risk due to major hazards 2 reflecting how the risks generated by rapid economic growth are transferred to low-income households and communities who least enjoy its benefits. Analysing extensive risk highlights a key development challenge of our time: how to strengthen risk governance capacities fast enough to address the rapidly increasing exposure of population and assets that accompanies economic growth. Extensive risk exists wherever development occurs, and it is directly constructed by risk drivers such as badly planned and managed urbanization, environmental degradation and poverty. Extensive disaster losses and their downstream impacts on health, education, structural poverty and displacement go unaccounted for in most countries, hiding the real cost of disasters. Also, as the earthquake in Haiti showed, the extensive risks of today can become the intensive risks of tomorrow when they accumulate in places exposed to major hazards such as earthquakes or tropical cyclones. 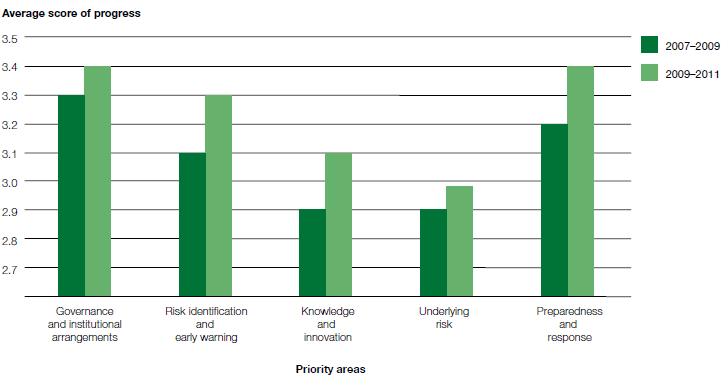 How well a country is able to address these risk drivers is an indicator of its risk governance capacities. In general, countries with weak governance and that have great difficulty addressing these drivers are low- and lower-middle-income countries (Figure 3). The countries with the lowest risk governance capacities, such as Afghanistan, Haiti or Chad, are also experiencing conflict or political instability and have development trajectories that have been diverging not only from high-income countries but from successful low- and middle-income countries. Some middle-income countries, such as Costa Rica or Chile, have comparatively high risk governance capacities. But even there, while disaster mortality rates are being cut, housing damage continues to increase, highlighting again that vulnerability reduction is not compensating for the increasing exposure that accompanies economic growth. Children are particularly vulnerable, with estimates suggesting that at least 66 million children are affected by both extensive and intensive disasters each year.4 Extensive disaster events were found to reduce school enrolment in Bolivia, Indonesia, Nepal and Viet Nam. Girls seem to suffer most: the gender gap in achieving primary education widens significantly after extensive disaster events. Health impacts on young children should also not be underestimated. Extensive disasters resulted in increased incidences of diarrhoea in children under five years of age in Bolivia, more malnourished children under the age of three in Nepal, and increased infant mortality in Viet Nam, pointing to the need for greater consideration of children’s vulnerability and needs. Disasters also lead to large-scale internal displacement. Pakistan’s 2010 floods left an estimated 6 million people in need of shelter, the same number as those uprooted by India’s 2008 floods. Extensive disasters account for about one-fifth of destroyed housing, which creates an additional invisible source of displacement, given that those that are affected by such events are less likely to receive international humanitarian assistance. Whereas trends in earthquake mortality risk were not measured in this report, rapid economic and urban development in earthquake-pronelow- and middle-income countries is leading to exponential increases in the number of exposed and vulnerable people and property. The massive mortality that occurred in Haiti in 2010 is unlikely to be an isolated occurrence, and other cities such as Dhaka in Bangladesh represent disasters waiting to happen. Countries are faced with a range of emerging risks associated with extremely low-probability hazards, such as volcanic eruptions or extreme space weather, and new patterns of vulnerability associated with the growing complexity and interdependency of the technological systems on which modern societies depend: energy, telecommunications, finance and banking, transport, water and sanitation, etc. The tsunami-driven nuclear disaster in Fukushima, Japan, highlights how these new vulnerabilities multiply disaster risks and can trigger cascading and concatenated system breakdowns at different scales which are difficult to model but which can exponentially magnify impacts. Compared to other hazards, risks associated with drought remain poorly understood and badly managed. Meteorological drought is a climatic phenomenon rather than a hazard per se. It only becomes hazardous when it is translated into agricultural or hydrological drought, depending on factors other than just rainfall. With no systematic data or a credible global drought risk model, it is impossible to provide a world-wide assessment of patterns and trends in drought risks. Available evidence, however, provides a good indication of the magnitude and inter-relatedness of impacts on mortality and well-being, rural livelihoods, food security, agricultural production (Figure 4), economic and urban development, migration, conflict, the environment and public spending. Thanks to improved early warning, preparedness and response, the massive mortality from sub-Saharan African droughts in the 1970s has not been repeated. 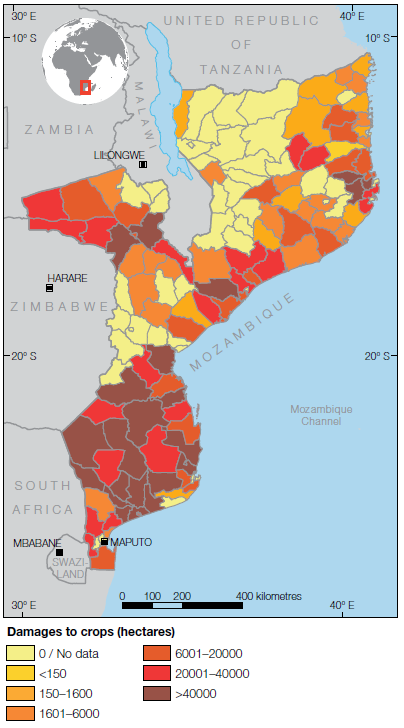 However, the social and economic impacts of drought are still disproportionately concentrated on poor rural households that depend on rain-fed subsistence agriculture. What then turns poor rainfall into disaster events? Drought risk is constructed by a multitude of environmental, economic and social factors that all increase vulnerability and exposure of vulnerable populations and economies. The following are key drivers of both hydrological and agricultural drought risk, though not all are sufficiently taken into account in development planning. Decreasing rainfall, climate variability and climate change. Average annual rainfall has been decreasing in many regions in the past century. In areas with increasing water stress, even less intense drought episodes are now manifesting as agricultural or hydrological droughts. Poverty and rural vulnerability. Poor rural households whose livelihoods depend on rainfed subsistence agriculture are very exposed and vulnerable to drought, and are least able to buffer and absorb its impacts. Even minor droughts can lead to yield reductions with devastating livelihood impacts. Increasing water demand due to urbanization, industrialization, tourism and the growth of agribusiness. Economic growth in sectors such as tourism, where per capita water consumption may be 3–10 times greater than local domestic consumption, can lead to increased and conflicting demands for often declining water resources, unless these are carefully managed. Inappropriate soil and water management. Unsuitable agricultural or livestock practices are drivers that contribute to drought risk, and can occur even in regions where rainfall is high, above average or increasing. Weak or ineffective risk governance. Given that drought losses and impacts are not systematically recorded and mainly affect rural and subsistence households, there is often little or no political incentive to seriously address drought risk. Despite progress in forecasting, early warning and response, few countries have integrated policies or institutional frameworks to address the drivers of drought risk, and drought is rarely included within broader policy and institutional frameworks for disaster risk management (DRM). Meteorological agencies may be well equipped to provide increasingly accurate hazard assessments and warnings, but they are not responsible for addressing other risk drivers such as land use, water management, urban development and social protection. Such drivers are increasing vulnerability and exposure. Therefore, strengthening drought risk management as an integral part of risk governance is fundamental to sustaining the quality of life in affected countries. This report offers only a first insight to the complexities of global drought risk: understanding and revealing the full spectrum is a challenge that must be addressed in the years to come. Governments report major progress against the objectives and goals of the HFA, particularly in strengthening disaster management and the policies that underpin it (Figure 5). Significant momentum in the implementation of the HFA is also being generated through the development of regional and sub-regional efforts. The number and quality of country reports prepared provides evidence of a growing political interest in reducing disaster risk. Interim reports for 2009–2011 were received from 82 countries or territories, with a total of 133 participating in this review cycle. The process is led and owned by inter-governmental organizations, governments and local government institutions at regional, national and local levels, respectively, who are engaged in consultation across key sectors, including agriculture, water, transport, health and education. The multi-tier HFA Progress Review allows countries to reflect on their efforts to strengthen capacities, and identify strengths and gaps at local, national and regional levels. Offering a framework for analysis, it catalyses both strategic and action-oriented planning. When governments engage key public, civil society and academic stakeholders in the review process, communication and consensus building improve. Importantly, discussions regarding indicators and progress help to generate a common language and understanding, fostering real dialogue among different government actors and with civil society. There is continuing difficulty integrating risk reduction into public investment planning, urban development, environmental planning and management, and social protection. Few countries reported the systematic recording of losses or comprehensive assessment of their risks. Less than half of these countries undertook multi-hazard risk assessments and less than a quarter did so in a standardized manner. Although these figures are reason for concern, reports submitted by some governments do reflect a growing and sophisticated understanding of the complexities involved. Promising developments are seen as countries begin to adapt existing development instruments to address disaster risk. Two other major challenges remain: gender and education. In 2009, only 20 percent of countries reported substantial achievement integrating gender into disaster risk reduction, with no improvement two years later. Public awareness of risks and of how to address them is key to strengthening accountability and ensuring implementation of DRM, but only 20 countries reported substantial progress in this area. Unsurprisingly, given their lack of progress assessing risks and accounting for losses, countries have difficulty justifying investments in DRM. Most countries across all geographical and income regions reported relatively little progress assigning dedicated resources to strengthening their risk governance capacities. Resources allocated for DRM within sectors and for local governments are even more limited, with only 26 countries confirming dedicated budget allocations to local levels. Many regional inter-governmental organizations have successfully developed regional risk reduction frameworks and strategies, but challenges in addressing trans-boundary risks remain. Progress on regional cooperation is slow and hampered by limited commitment of member states, limited resources and competing priorities and responsibilities of different government departments. Also, the fact that frameworks are usually not legally binding, nor have significant sanctions attached to noncompliance, is a major impediment to effective implementation. Despite these challenges, there are some successful trans-boundary initiatives such as early warning among the Arab States, showing what can be done. Political and economic imperatives for disaster risk reduction remain elusive. Individuals tend to discount the value of future loss, and as a consequence are unwilling to invest today for a safer tomorrow. Politicians with short electoral horizons may be even less inclined. Large disasters can create a social demand for risk reduction, but that does not always translate into sustained engagement. Also, though investments in improving preparedness and response rarely affect vested economic and political interests, seriously addressing underlying risk drivers almost certainly will. When disaster losses, impacts and risks are properly accounted for, the sheer scale of probable future losses may be enough to shock governments into action. In any case, loss accounts and probabilistic models facilitate more considered decisions based on an assessment of the costs, benefits and trade-offs internalized in public investment. Expected economic losses are substantial. In Colombia, estimated annual disaster losses represent approximately 1 percent of GDP. Although this is less than the cost of cyclical unemployment, disaster losses are higher than the cost of 5 percent inflation and are comparable to the cost of armed conflict. Furthermore, the maximum probable disaster losses with return periods of 500 and 1,000 years represent costs of 2.3 percent and 2.9 percent of GDP, respectively, equivalent to the losses caused by the financial crises of the 1980s and 1990s.8 These figures indicate that if decision-making were based on a realistic assessment of the social and economic costs and benefits, DRM should have a similar public policy importance as controlling inflation or resolving armed conflict. This is the real scale of expected disaster loss in these countries. It shows the magnitude of public funds required were a government to compensate for public assets and support the recovery of low-income households and communities. In reality, most governments do not meet their responsibility of covering substantial losses from recurrent, small-scale events, which are usually transferred to and borne by low-income households. With some notable exceptions, governments are rarely adequately prepared, by either contingent financing or insurance, to cover the probable maximum losses from a low-probability intensive event. Taken by surprise by liabilities that they have never assessed, governments are then forced to rely on slow and often unreliable international assistance for recovery and reconstruction. 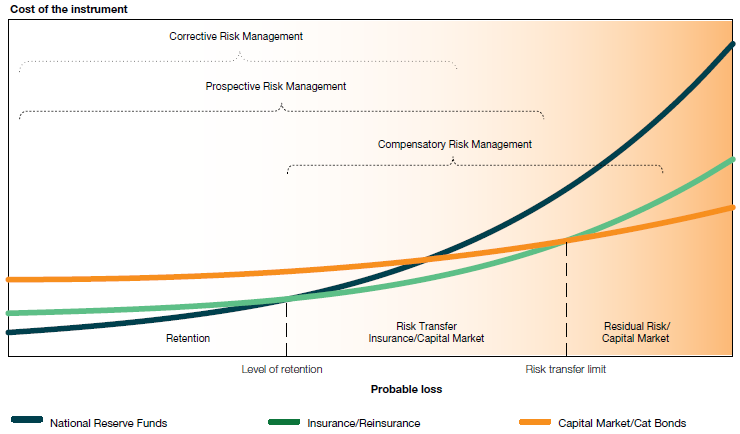 From a risk-financing perspective, there are three possible strategies that a government can adopt to manage disaster risk: retain the risk, insure the risk, and/or transfer the risk to capital markets (Figure 7). The choice is ultimately a policy decision, based on considerations such as the value of the annual average and probable maximum loss, the fiscal space or capacity to invest in risk reduction, social and political acceptance of risk, and access to risk financing. As the intensity of risk increases, the cost of risk reduction increases exponentially, whereas the probability of realizing the benefits in a given period of time decreases. In general, it is more cost-effective for governments to invest in reducing the more extensive risks they would have to retain, using a mix of prospective and corrective DRM strategies, rather than absorbing the annual expected losses. The cost-effectiveness of each should be assessed, for example, improving building and land use decisions (prospective), compared with reinforcement of unsafe buildings, relocation of exposed settlements to less hazardous locations, or construction of hazard mitigation measures (corrective). Although corrective risk management typically produces a positive benefit–cost ratio, it is far more cost-effective to anticipate and avoid the build-up of risk than to correct it. Corrective risk management investments are most costeffective if they concentrate on retrofitting the most vulnerable and critical facilities, rather than being spread widely over many risk-prone assets. In Mexico for example, the ratio of benefits to costs when investing in strengthening risk-prone public buildings is far more attractive when it is focused on the most vulnerable 20 percent. Informed targeting of corrective investments becomes even more attractive when the political and economic benefits of avoiding loss of life and injury, decreasing poverty and increasing human development, are taken into account. Saving human lives may be a more powerful incentive for DRM than pure cost-effectiveness. Different country contexts create different distributions of risk strata, and correspondingly, different ‘optimal’ portfolios of prospective, corrective and compensatory risk management. Systematic disaster loss accounting and comprehensive risk assessment does not guarantee that governments will invest more. They can, however, encourage governments to take ownership of their stock of risk, and identify strategic trade-offs when making policy decisions for or against investing in DRM. Runaway increases in exposure and risk are pushing up disaster costs, while countries and communities are struggling to reduce their vulnerabilities. The link between this increase in costs and development policies has not been sufficiently explored. But what is clear is that besides reducing disaster mortality, existing risk governance capacities and arrangements are generally failing to achieve their aims. A new paradigm is required that must address the disaster risks internalized in, and sometimes generated by, development processes. Climate change adaptationbr> The momentum to implement country-level adaptation may owe more to perceived opportunities to access climate change funding than to social demand. Nonetheless, as most such measures address disaster risks, they offer additional means of implementing DRM. Unfortunately, as with DRM itself, most adaptation initiatives to date are delivered through stand-alone projects and programmes, which do little more than nibble away at the edges of risk construction and are yet to be fully integrated into development planning. For countries to reduce their vulnerabilities significantly, a different approach is required, adapting existing development mechanisms to reduce risks and strengthen climate resilience. Fortunately, innovative low- and middle-income countries are starting to use instruments designed, for example, to evaluate public investment decisions or reduce structural poverty. By making them risk-sensitive, governments can address risk on a much larger scale and allow both adaptation and DRM to be delivered through existing administrative capacities. This can avoid the creation of new risk and generate important co-benefits for society. In low- and middle-income countries, public investment usually ranges from 3 to 15 percent of GDP. Peru’s National Public Investment System approved investment of approximately US$10 billion in 2008, with half to be executed by local governments. In comparison, overseas development assistance that year was only US$266 million. The scale of such public investment dwarfs current investment in either DRM or adaptation. Therefore, assessing disaster risks internalized in public investment and ensuring inclusion of cost-effective risk reduction measures, has huge implications for the country’s stock of risk and could lead to rapid and sustained risk reduction. Several challenges need to be overcome if this tremendous potential is to be realized. First, although disaster risks are evaluated in public investment project design, there is no analogous process earlier in the planning sequence. As a consequence, higher-level planning decisions, or the lack thereof, may actually create risks that are not evaluated and addressed until the project stage. Second, the evaluation of the costs and benefits of reducing risks requires comprehensive probabilistic risk assessments, which are still not available in most countries. Finally, new mechanisms for planning and budgeting at local levels, and stronger partnerships with civil society and local governments, are essential if public investment is to be effective, sustainable and relevant to local needs. Social protection, including support payments and insurance against risk, does not reduce disaster risk in itself. Nor is it an alternative to development investments in public infrastructure and services. However, there are two compelling reasons why social protection should be part of a larger DRM strategy. Social protection instruments can enhance disaster resilience, reduce poverty and stimulate human capital development.13 They provide buffers in times of need and keep disaster losses from cascading into other household impacts and outcomes, such as taking children out of school, or selling off productive assets14 – coping strategies with negative long-term consequences.15 Although such instruments were not designed to deal with disaster impacts, they can be adapted to reach those at risk, preventing significant medium- to long-term increases in the number of those suffering after disasters.16 For example, the Chilean government extended payments from the country’s social assistance programmes to households affected by the February 2010 earthquake. Second, many of these instruments are already being delivered on a large scale. Almost 114 million people in Latin America and the Caribbean have received conditional cash transfers as a means to reduce structural poverty over the last two decades. The Mahatma Gandhi National Employment Guarantee Scheme in India reached around 68 million people in 2009–2010 alone, and South Africa’s Expanded Public Works Programme, in operation since 2004, provides work for more than 10 percent of the country’s unemployed.17 Adapting targeting criteria and timeframes of these instruments can benefit more disaster-prone and vulnerable groups at little additional cost. Given these important co-benefits, ecosystembased DRM often realizes highly attractive benefit–cost ratios compared with conventional engineering solutions. Experience from around the world shows that ecosystem-based DRM is an increasingly attractive option for addressing problems as varied as river basin and urban flooding, drought and wildfires. For example, New York City has decided to invest US$5.3 billion in green infrastructure on roofs, streets and sidewalks to reduce flooding instead of US$6.8 billion in traditional pipe and tank improvements.21 This promises multiple benefits. The new green spaces will absorb more rainwater and reduce the burden on the city’s sewage system, air quality is likely to improve, and water and energy costs may fall. However, the monetary undervaluation of ecosystem services remains an important obstacle to the adoption of ecosystem-based DRM. As a consequence, relatively few countries are taking advantage of tools such as ‘payments for ecosystem services’. Decisions on land use and building can push up risk significantly, especially in cities with large informal settlements and limited local government willingness or capacity to manage city expansion in the public interest. Unfortunately, most local governments in low- and middle-income countries have no functioning land use planning or management system or have lost control over managing land use changes. As a consequence, land use planning and management in low- and middle-income countries have excluded a large proportion of the urban population from legal land and housing markets, thus increasing urban risk. Given their informal status and lack of secure tenure, households in informal settlements are generally excluded from public investments in vital risk-reducing infrastructure and services. Critically, planning is often disconnected from realities on the ground. Planning cycles of three years or more mean that when adopted, plans may have already been overtaken by development, especially in rapidly growing cities of low- and middle-income countries. Also, without enforcement, even the best land use planning cannot change land use practices. Balancing low-income groups’ need for well-located land with disaster-reduction objectives remains a difficult task, especially where affected communities are not allowed to participate in decision-making. The design and enforcement of building legislation, regulation, codes and standards presents similar issues, because requirements are often inappropriate for national or local conditions.22 Particularly after disasters, overly complicated codes and standards are often introduced that cannot be maintained. These can be prohibitively costly for low-income households, particularly in informal settlements, further increasing unregulated construction. Authorities may also use the enforcement of strict codes as a pretext for evicting people in informal settlements. Innovations in local governance around the world show that new planning and urban development approaches are possible when civil society participation is supported by a new generation of mayors and civil servants. There are increasing examples of low-income communities negotiating safer and better-located land, adapting rigid zoning and building standards to local needs, upgrading vulnerable settlements to reduce risks, and participating in planning and budgeting.23 These practices contribute to reducing risks but have much wider benefits, from enhanced citizenship and social cohesion to planned urban development and greater investment. In this way, planning and building regulations can drive DRM instead of impeding it. Taking advantage of these development opportunities requires a radical reform of risk governance. The aims – enhanced political commitment and policy coherence in central government, competent and accountable local governments, and an openness to work in partnership with civil society, especially low-income households and communities. When responsibility for national DRM policy rests with emergency management organizations or relatively peripheral ministries, it is unlikely to shape development investment. On the contrary, it tends to reinforce the existing skewed focus on disaster management and stand-alone DRM investments. Overall responsibility for DRM should be anchored in a ministry or office that has the political authority to ensure policy coherence across development sectors, and the integration of DRM into national development planning. If responsibility for DRM and climate change adaptation within central government is localized in national planning departments or ministries for economy and finance, it can have a positive influence on the effectiveness of policy and accompanying legislation. Given their role in deciding allocations of the national budget, these ministries have greater political leverage over planning and investment, which could be applied to DRM if they had the policy responsibility. The quality of national and local governance in general, and factors such as voice and accountability in particular, influence the level of disaster mortality and economic loss.28 One of the most important drivers of accountability is access to information, particularly to information on disaster risks.29 However, access to information is only effective when governments actively support the right to information, and when citizens are aware of their legal right and are willing to assert it. A culture of social accountability directly improves the effectiveness of governance and service delivery.30 In DRM, as in many development sectors, establishing this is not straightforward though there are examples where direct responsibility for action and inaction is monitored, as in Indonesia where recent legislation makes leaders personally responsible for disaster losses. Without innovative local partnerships between civil society, local and central government and other stakeholders, instruments such as public investment planning or conditional transfers are unlikely to be effective. Without them, land use management policies and building regulations may even construct risk rather than reduce it. Civil society organizations, where they have the opportunity and ability to organize and voice their positions, can reduce local risks while building political and economic imperatives for DRM. Successfully implementing and scaling up local initiatives require new capacities and skills in local and central government. It also requires a cultural change in attitudes of municipal governments, contractors and non-governmental organizations, towards working in partnership with low-income households. Although this is currently the exception and not the rule, new meso-level partnerships involving community organizations are slowly but steadily creating the necessary shift. Each country has its own unique risk profile or signature with different kinds and proportions of extensive, intensive and emerging risks. To reduce their risks, therefore, governments will need to adopt a mix of prospective, corrective and compensatory risk management strategies together with strategies to manage disasters and anticipate emerging risks. Countries that have invested in strengthening their disaster management capacities have witnessed a steady decline in mortality risk, at least with respect to weather-related hazards. However, much more needs to be done to reduce economic losses fuelled by the rapid growth of asset exposure. If the objective of the Hyogo Framework for Action – the significant reduction of disaster losses – is to be achieved and if progress is to be made towards the UN’s Millenium Development Goals, a new paradigm in disaster risk reduction must emerge. Reducing disaster risk is primarily an issue of identifying the political and economic incentives and negotiating the different trade-offs. Unfortunately, without systematically accounting for disaster impacts and comprehensively assessing the full range of risks they face, few countries have been able to find these incentives, let alone to identify the costs, benefits and trade-offs that would inform a balanced and effective portfolio of risk management strategies. The good news is that a new paradigm is indeed emerging. It is driven by innovations in accounting for disaster losses and assessing risk, in the adaptation of development planning and public investment, and in efforts to strengthen risk governance by those governments that have recognized the importance of investing today for a safer tomorrow. An opportunity to reduce disaster risk is now appearing: learning from, building on, and scaling up these innovations; revealing risk; and redefining development. 1 ADB/World Bank. 2010. Preliminary floods damage and needs assessment. Islamabad, Pakistan: Asian Development Bank and the World Bank. 2 Analysis of losses based on national databases of 21 countries and states. For more information please see gar-isdr.desinventar.net. DARA. 2011. Indice de reduccion del riesgo. Análisis de capacidades y condiciones para la reducción del riesgo de desastres. Madrid, Spain: DARA.
. Indice de reduccion del riesgo. Análisis de capacidades y condiciones para la reducción del riesgo de desastres. Madrid, Spain: DARA; Lavell, A., Canteli, C., Rudiger, J. and Ruegenberg, D. 2010. Data spread sheets developed in support of the DARA “Risk reduction index: Conditions and capacities for risk reduction”. Geneva, Switzerland: UNISDR. 4 Penrose, A. and Takaki, M. 2006. Children’s rights in emergencies and disasters. Lancet 367(9511): 698–699; Bartlett, S. 2008. The implications of climate change for children in lower-income countries. Children, Youth and Environments 18(1): 71–98; Costello, A. 2009. Managing the health effects of climate change. Lancet 373: 1693. 5 INGC (Instituto Nacional de Gestão de Catastrofes). 2010. Drought-related crop damages 1990–2009, by district. Maputo, Mozambique: Instituto Nacional de Gestão de Catastrofes. 6 Horridge, M., Madden, J. and Wittwer, G. 2005. The impacts of the 2002–2003 drought on Australia. Journal of Policy Modelling 27 (3): 285–308. 7 Erian, W., Katlan, B. and Babah, O. 2010. Drought vulnerability in the Arab region: Special case study: Syria. Background paper prepared for the 2011 Global Assessment Report on Disaster Risk Reduction. Geneva, Switzerland: UNISDR. 8 Moreno, A. and Cardona, O.D. 2011: Efectos de los desastres naturales sobre el crecimiento, el desempleo, la inflación y la distribución del ingreso: Una Evaluación de los casos de Colombia y México. Background paper prepared for the 2011 Global Assessment Report on Disaster Risk Reduction, Geneva, Switzerland: UNISDR. 9 ERN-AL. 2011. Probabilistic modelling of disaster risk at global level: development of a methodology and implementation of case studies, Phase 1A: Colombia, Mexico, Nepal. 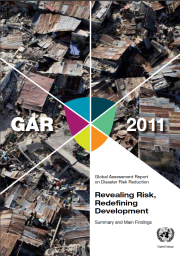 Background Paper for the 2011 Global Assessment Report on Disaster Risk Reduction, Geneva, Switzerland: UNISDR. ERN-AL, 2011. Probabilistic modelling of disaster risk at global level: Development of a methodology and implementation of case studies. Phase 1A: Colombia, Mexico, Nepal. Background Paper prepared for the 2011 Global Assessment Report on Disaster Risk Reduction. Prepared by the Consortium Evaluación de Riesgos Naturales – América Latina. Geneva, Switzerland: UNISDR. Click here to view this GAR paper. – see note 9 for details. 13 de Janvry, A., Sadoulet, E. and Vakis, R. 2010. Protecting vulnerable children from uninsured risks: Adapting conditional cash transfer programs to provide broader safety nets. Well-being and Social Policy 6(1): 161–183; Siegel, P. and de la Fuente, A. 2010. Mainstreaming natural disaster risk management into social protection policies (and vice versa) in Latin America and the Caribbean. Well-being and Social Policy 6(1): 131–159. 14 de Janvry, A., Sadoulet, E., Vakis, R. and Finan, F. 2006. Uninsured risk and asset protection: can conditional cash transfer programs serve as safety nets in keeping children at school and from working when exposed to shocks? Journal of Development Economics 79 (2): 349–373; ERD. 2010. Social protection for inclusive development – A new perspective on E.U. cooperation with Africa. The 2010 European report on development. Florence, Italy: Robert Schuman Centre for Advanced Studies, European University Institute. Draft; Guarcello, L., Mealli, F. and Rosati, F. 2010. Household vulnerability and child labour: The effect of shocks, credit rationing and insurance. Journal of Population Economics 23(1): 169–198. 15 López-Calva, L.P. and Ortiz-Juárez, E. 2009. Evidence and policy lessons on the links between disaster risk and poverty in Latin America: Methodology and summary of country studies. New York, USA: UNDP; Fernandez, A., Jadotte, E. and Jahnsen, J. 2011. Addressing disaster risk through conditional cash transfer and temporary employment programs in Latin America and the Caribbean. UNDP Background paper prepared for the 2011 Global Assessment Report on Disaster Risk Reduction. Geneva, Switzerland: UNISDR. Fernandez, A,. Jadotte, E. and Jahnsen, J. 2011. Addressing disaster risk through conditional cash transfer and temporary employment programs in Latin America and the Caribbean. Background paper prepared for the 2011 Global Assessment Report on Disaster Risk Reduction. Prepared by UNDP. Geneva, Switzerland: UNISDR. – see note 15 for details. 17 Krishnamurty, J. 2011. Employment policies and disaster risk reduction. Background Paper prepared for the 2011 Global Assessment Report on Disaster Risk Reduction. Geneva, Switzerland: UNISDR; Fernandez et al., 2011. 18 del Ninno, C., Subbaro, K. and Milazzo, A. 2009. How to make public works work: A review of the experiences. SP Discussion Paper 0905, World Bank, Washington; Pelham, L., Clay, E. and Braunholz, T. 2011. Natural Disasters – What is the role for social safety nets? SP Discussion Paper 1102. Washington DC, USA: World Bank. 20 Costanza, R., Perez-Maqueo, O., Martinez, M. L., Sutton, P., Anderson, S.J. and Mulder, K. 2011. The value of coastal wetlands for hurricane protection. AMBIO: A Journal of the Human Environment 37 (4): 241-248. New York City. 2010. NYC green infrastructure plan: A sustainable strategy for clean waterways. New York, USA: City of New York.
. NYC green infrastructure plan: A sustainable strategy for clean waterways. New York, USA: City of New York. 22 Johnson, C. 2011. Creating an enabling environment for reducing disaster risk: Recent experience of regulatory frameworks for land, planning and building. Background Paper prepared for the 2011 Global Assessment Report on Disaster Risk Reduction. Geneva, Switzerland: UNISDR. 23 Bicknell, J., Dodman, D. and Satterthwaite, D. eds. 2009. Adapting cities to climate change: Understanding and addressing the development challenges. London, UK: Earthscan; Satterthwaite, D. 2011. What role for low-income communities in urban areas in disaster risk reduction? Background Paper prepared for the 2011 Global Assessment Report on Disaster Risk Reduction. Geneva, Switzerland: UNISDR. 24 Pelling, M. 2007. Learning from others: Scope and challenges for participatory disaster risk assessment. Disasters 31(4): 373–385; ECHO (European Commission Humanitarian Aid department). 2008. Vulnerabilidades, capacidades y gestión de riesgo en la república del Perú. Brussels, Belgium: European Commission Humanitarian Aid department. 25 von Hesse, M., Kamiche, J. and de la Torre, C. 2008. Contribución temática de America Latina al informe bienal y evaluación mundial sobre la reducción de riesgo 2009. Contribution to the GTZ-UNDP Background Paper to the 2009 Global Assessment Report on Disaster Risk Reduction. Geneva, Switzerland: UNISDR; Scott, Z. and Tarazona, M. 2011. Decentralization and disaster risk reduction. Study on Disaster Risk Reduction, Decentralization and Political Economy Analysis for UNDP contribution to the Global Assessment Report on Disaster Risk Reduction 2011. Geneva, Switzerland: UNISDR. 26 Scott, Z. and Tarazona, M. 2011 – see note 25 for details. Scott, Z. and Tarazona, M. 2011. Decentralization and disaster risk reduction. Study on disaster risk reduction, decentralization and political economy analysis for UNDP contribution to the 2011 Global Assessment Report on Disaster Risk Reduction. Geneva, Switzerland: UNISDR. – see note 25 for details. UNISDR (United Nations International Strategy for Disaster Reduction). 2009. Global assessment report on disaster risk reduction: Risk and poverty in a changing climate. Geneva, Switzerland: United Nations International Strategy for Disaster Reduction. Click here to go to GAR09 page.
. Global assessment report on disaster risk reduction: Risk and poverty in a changing climate. Geneva, Switzerland: UNISDR. 29 World Bank. 2010. Natural hazards, unnatural disasters: The economics of effective prevention. Washington: World Bank and United Nations; Gupta, M. 2011. Issue paper on accountability and partnerships in DRR filling the governance ‘gap’ in disaster risk reduction. Background Paper prepared for the 2011 Global Assessment Report on Disaster Risk Reduction. Geneva, Switzerland: UNISDR. Daikoku, L. 2010. Citizens for clean air, New York. Case study prepared for the ADRRN Background Paper to the 2011 Global Assessment Report on Disaster Risk Reduction. Geneva, Switzerland: UNISDR.
. Citizens for clean air, New York. Case study for Gupta 2011. Gupta, M. 2011. Filling the governance ‘gap’ in disaster risk reduction. Background Paper prepared by the Asian Disaster Reduction and Response Network (ADRRN) and for the 2011 Global Assessment Report on Disaster Risk Reduction. Geneva, Switzerland: UNISDR. Satterthwaite, D. 2011. What role for low-income communities in urban areas in disaster risk reduction? Background Paper prepared for the 2011 Global Assessment Report on Disaster Risk Reduction. Geneva, Switzerland: UNISDR. – see note 23 for details. 32 Olson, R., Sarmiento Prieto, J. and Hoberman, G. 2011. Disaster risk reduction, public accountability, and the role of the media: Concepts, cases and conclusions. Background Paper for the 2011 Global Assessment Report on DRR. Geneva, Switzerland: UNISDR. 33 Radford, T. and Wisner, B. 2011. Media, communication and disaster. In Handbook of hazards and disaster risk reduction. B. Wisner, J.C. Gaillard and I. Kelman, eds. London, UK: Routledge (in press); Wisner, B., Kent, G., Carmalt, J., Cook, B., Gaillard, J.C., Lavell, A., Oxley, M., Gibson, T., Kelman, I., van Niekerk, D., Lassa, J., Delica Willison, Z., Bhatt, M., Cardona, O.-D., Benouar, D. and Narvaez, L. 2011. Political will for disaster reduction; What incentives build it, and why it is so hard to achieve? Background Paper prepared for the 2011 Global Assessment Report on Disaster Risk Reduction. Geneva, Switzerland: UNISDR. 34 Satterthwaite, D. 2011. What role for low-income communities in urban areas in disaster risk reduction? Background Paper prepared for the 2011 Global Assessment Report on Disaster Risk Reduction. Geneva, Switzerland: UNISDR. 35 Maskrey, A. 2011. Revisiting community-based disaster risk management. Environmental Hazards 10: 1–11. Contact us | Disclaimer | Our Sponsors | References | Acknowledgements | PreventionWeb | The Global Platform | © United Nations 2011.